Public Beta Program: To register, simply click the "Login/Register" button in the upper-right hand corner. 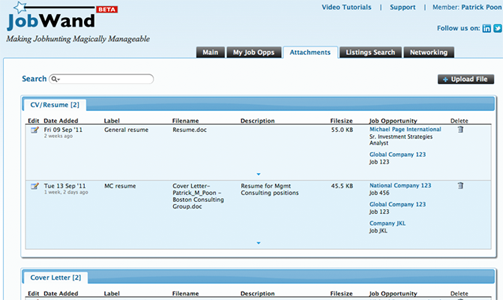 Organize all the different versions of your resumes, cover letters, etc. Search by keyword and job opportunity. Available in Fall 2013, we will offer mobile apps to make your job search data available when you're out and about. You can import your existing job search spreadsheet into JobWand, and get up-and-running in no time. 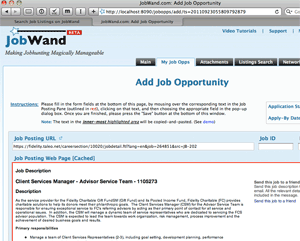 JobWand is a comprehensive web-based alternative to the typical, constrained spreadsheet for job search management. If you are tracking more than 5 job opportunities, JobWand is ideally suited for you. 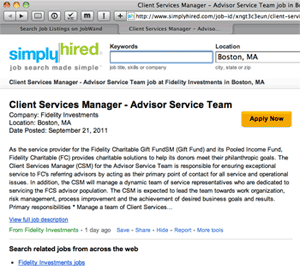 Use of the website is FREE for job and internship seekers. To use LinkedIn features, please sign in to LinkedIn and authorize JobWand to act as an agent.